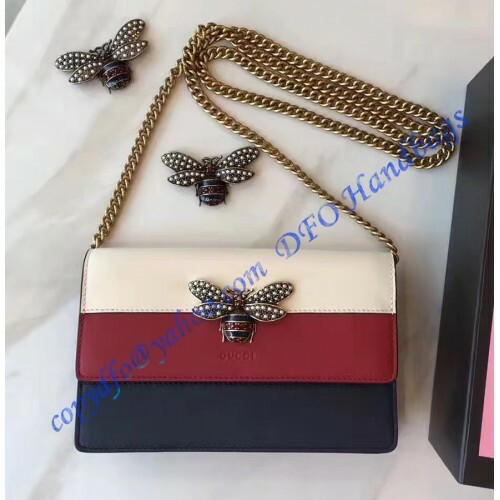 Queen Margaret Leather Mini Bag is one of the recent models which attracts public attention. The main difference or the main advantage is in the colors. We have red, white and blue. Combined, these colors can truly make a difference and they make the entire bag look 100% different than other bags on the open market. In other words, there are no other bags with the same color pattern. A chain strap seems to be the most obvious choice and it matches the rest of the bag. One of the biggest advantages of this bag is the space inside. There is more of it than you will get from other models and it is perfect for a bit bigger items. But, you also get one flat and one zipper pocket inside. Then we have space under the foldable piece for your smartphone (it is optimized for iPhone or other, high-end models) and slots for 6 credit cards. Additional space isn’t something you will need here! 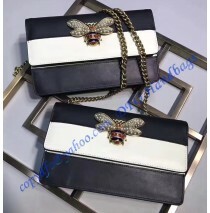 The chain strap is detachable and it has a length of 23.5 inches. Nevertheless, the red leather has the main role here. It looks fantastic and it is superb in any way imaginable. You won’t have any issue matching the bag with your clothes.